After you’ve chosen your drapery or had your custom drapery made, the next decision you will have to make will be the choice of curtain rods and other drapery hardware. Although it may seem like a trivial detail, your choice of curtain rods can make a significant difference in the final aesthetics of your drapery. Choosing a rod that’s too dark for a light space or fabric, for example, will naturally draw your eyes to the contrasting colours and create a undesirable focal point near the ceiling of your room. With this in mind, make sure to choose drapery hardware that complements not only your existing home décor, but also the colour and type of fabric of the curtain that you are hanging. To hang most curtains and drapes, you will need at the minimum a curtain rod, finials and brackets. Optional drapery hardware, which can sometimes be dependent on the type of drapery you have, are tiebacks, rings and drapery pins. Once you know what types of drapery hardware you will need, the next step is choosing the type of material. The choice of material for your drapery hardware can vary depending on the style of your home décor as well as the drapery itself. One of the most common choices for hardware materials is metal, which comes in a wide range of styles. Wrought iron, cast iron, brass, bronze, aluminum, nickel and chrome are all types of metal hardware you can commonly find in Toronto’s drapery hardware market. When choosing metal hardware, consider matching the finish and colour of it to other metal finishes in the room, such as light fixtures and lamps. The other popular choice for hardware is wood. It’s also available in many different colours and finishes and is usually the better choice for more traditional home décor. The style and colour choices of wooden curtain rods and finials typically complement other wooden accents in a room, such as crown molding and baseboards. Curtain rods are usually attached to the wall between the window and the ceiling. Typically curtains are hung 6 inches above the window molding, but can be hung closer to the ceiling to give the window and room more visual height. Choose a rod with a diameter that’s thick enough not only to hold the drapery you’re installing but also to match the weight of the fabric. Extendable curtain rods are probably the most common type and come in many different materials. Drapery is hung on these using rings, clips or hooks. They adjust to the size of your window and are installed using brackets. Traverse rods make it simple to draw your curtains using a cord. Normally used with pinch-pleat curtains, this type of rod has the drapery hanging from hooks that sit in a track. This allows you to fully open or close the curtains without brackets getting in the way. Combination rods allow you to use just one set of brackets when you’ve chosen to go with a layered look for your window, as would be the case with a sheer layered underneath heavier drapery panels. The two curtain rods holding both layers sit in the same bracket at different distances from the window. While these are the most common types of rods, there are many others available. They include cable tension rods, spring-tension rods, café rods and I-beam tracks, among others. Speak to one of our design consultants for more details. Finials are the decorative pieces that are attached on the end of a curtain rod. They can be purchased separately or together with a rod and are screwed into its end. The size, colour and style of finials you choose to finish off the look of your curtain rod is an important one and should be selected with care. Curtain rings can attach to hooks in the curtain header, be clipped onto the drapery fabric, or sewn directly into it, depending on the look you’re trying to achieve. It might be obvious, but be sure to select rings large enough to comfortably accommodate your drapery rod. It can be challenging to slide curtain rings across a rod that’s too big. This usually means purchasing rings that are one third to one half bigger in diameter than the rod. Brackets are the pieces of drapery hardware that mount the curtain rod to the wall. They are available in several types and colours to match different rods. Normally you don’t have to worry about matching colours because they typically come with rods. You may, however, need to purchase extra ones to support heavy custom drapery such as blackouts that are heavy due to the extra lining they require. Holdbacks are usually u-shaped or straight pieces of drapery hardware that are mounted on the wall. They are designed to do exactly what they’re named for: to hold the curtains back, or open. They come in various materials and colours and are most often seen in traditional home décor, although some metal holdbacks also complement contemporary home décor quite nicely. Tiebacks serve the same purpose as holdbacks, except they’re generally made from fabric or tassels. They can be attached to a fixture on the wall or tied simply around the curtains to keep them open. 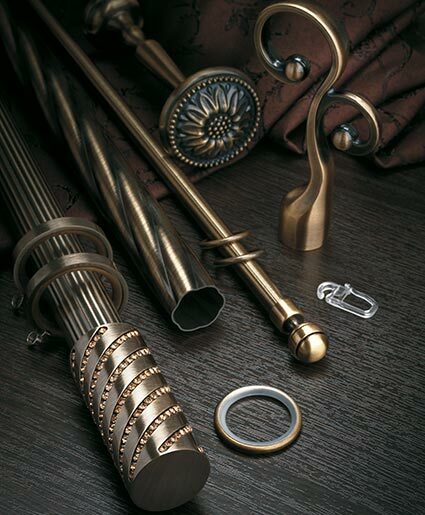 As you’ve seen, the choices available for drapery hardware are almost as numerous as the ones for drapery. Thankfully, our design consultants are here to guide you through the overwhelming array of options. Speak to one of them today so you can make informed decisions and choose the best window treatments for your home.